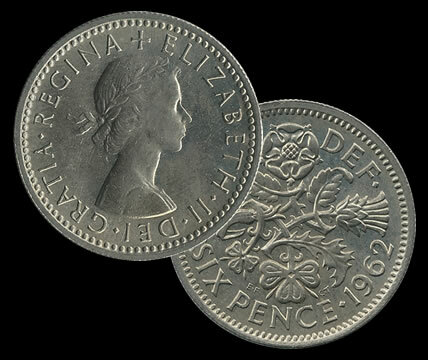 Since their release, British 6 Pence Coins have been considered good luck items. In fact, it is a British tradition for brides-to-be to wear them in their shoe. You may recall the saying, "Something old, something new, something borrowed, something blue, and a sixpence in her shoe". Coins are in good or better condition with date ranges from the 50's and 60's.